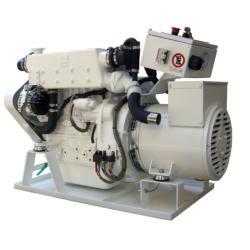 The “Stamegna” marine generators, is distinguished in two ranges: High speed 3000 RPM and Low speed 1500 RPM. Each range has been studied and projected to give the best performance in design, smallest dimensions, and low noise level and for easy yacht installation. Our production of generating sets in compliance to ISO, STANDARDS, the range covers power from 1 to over 2000 KVA, equipped with first brand international engines, as per: PERKINS - CUMMINS - IVECO AIFO - VOLVO PENTA - ODC - MTU - ISOTTA FRASCHINI - etc., available in different frequencies: 50 Hz at 1500 RPM or 60 Hz at 1800 RPM. Looking for integrated power generation systems and finding the best power solution, takes a relationship with someone who understands your challenges the way you do. We are close by and ready to deliver everything from installation to maintenance and service.